In early 1927, the ambassador, Sir Bielby Alston, was exasperated by the unsatisfactory leased house at Santa Theresa that he had shared with his chancery for some years. He therefore gave six months notice to terminate the lease, and announced that he would live in the summer residence at Petropolis, about forty miles away, until a new property had been bought in Rio. In the event, some building work at Petropolis over-ran and the ambassador had first to move for a while into the Hotel Gloria, while his chancery squeezed into the consulate-general’s leased offices in Rio. The ambassador kept up a vigorous campaign about his bad housing, including with visiting delegations and the local press, and at the end of 1927 the Office of Works announced that it would buy a site in the coming financial year and would send an architect to Río in the spring. Meanwhile, it asked the embassy to obtain a three month option on a property that had been commended to it at 71 Rua Real Grandeza. After due inspection, this property, comprising about 7,000 square metres between Rua Real Grandeza and Rua Matriz, was bought in 1928 for about £22,000 with the intention of demolishing the existing house and building anew. Some parts of the embassy moved straightaway into the existing house on a temporary basis, but objections to the suitability of this new acquisition began immediately. There was a suspicion in London that some members of the British community were joining the chorus in the hope that the Office of Works would change its mind and buy one of the sites that they had to offer. The debate stalled while the Brazilians toyed with the idea of a diplomatic enclave in Rio and the great financial crisis took its toll, after which demolition of the house was authorised in 1935. Nevertheless, a new ambassador, Sir Hugh Gurney, was asked to re-assess the position. He recommended against re-developing the Real Grandeza site, for reasons that the Office of Works found unconvincing. The Secretary, Patrick Duff, therefore sent his own team, comprising William Leitch, an assistant secretary, and AJ Pitcher, assistant chief architect, having induced all parties to agree to abide by their recommendation. Leitch reported in October 1938, favouring the purchase of a site at 360 Rua Sao Clemente, the building of a proper residence on it, and the leasing of office space elsewhere in Rio. This site, adjacent to one that the Americans had recently bought, was a long thin rectangle of over six hectares. It had an 80 metre wide frontage to a good street and a relatively level platform on which sat a house that would be demolished and replaced: beyond that the site stretched about 750 metres up the hillside, rising to an altitude of 300 metres. The vendor, the de Almeida e Silva family, was seeking £30,000 for the property. Leitch’s and Pitcher’s recommendations were accepted and 360 Rua Sao Clemente was bought in January 1939. The ill-fated Grandeza site was sold for £16,500 in 1942 to the Civil Religious Society of the Foundation of Christ Church. In 1939, Pitcher produced in London an outline design for the Rua Sao Clemente site which was roundly criticised by Gurney as fulfilling ‘my worst forebodings and shows a sad lack of comprehension of the requirements of an embassy …’. Most specifically, the dining room could not seat more than 24 at one table whereas Gurney thought that 36 should be the minimum, and he was hankering after the 48 that ‘we have found here … is by no means an excessive number for a dinner party’. The Office of Works had already decided that much of the architectural work would have to be done in Brazil. 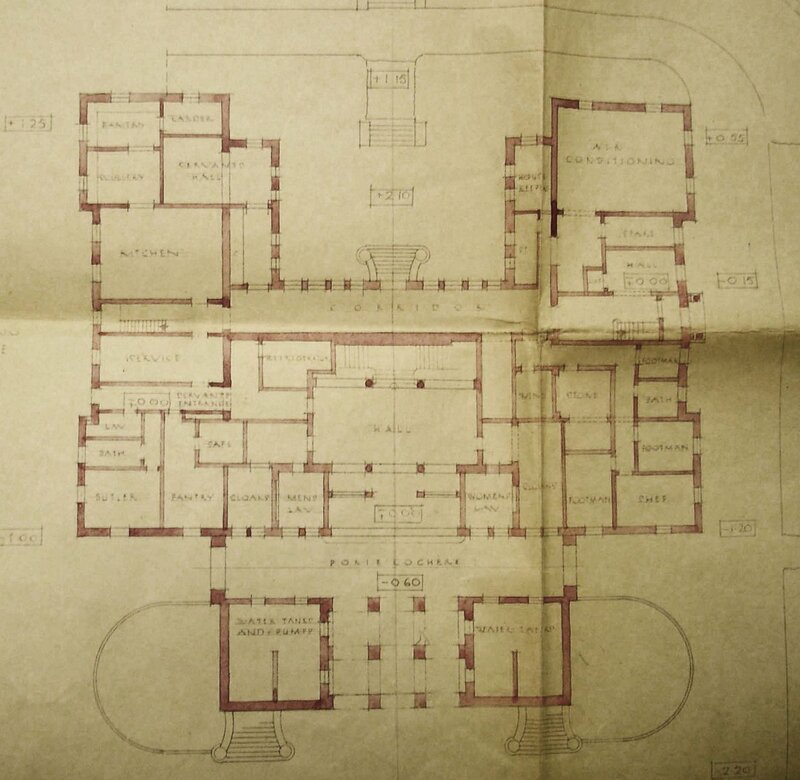 A respected local British architect, Robert Russell Prentice, whom Leitch and Pitcher had met during their visit, was therefore commissioned for design elaboration, working drawings and site supervision. Prentice was a 55 year old Scotsman, trained in Edinburgh and Paris, who had worked in Rio since 1922. Gurney, who had been playing with plans of his own, was happy with the choice of Prentice. Pitcher sent his outline proposals to Prentice who, after consultation with Gurney, produced a revised plan, of which Gurney approved. The project was definitively postponed in October 1939. The ambassador moved from Petropolis into the existing house on the 360 Rua Sao Clemente site. Viscount Davidson, visiting in 1942, described it as a charming, quiet and dignified house with good rooms, and noted that the ambassadress was furnishing it with exquisite taste. He described the garden as consisting of ‘a smallish lawn and one of Rio’s numerous hills…’. Early-ish plan of lower ground floor, 1943. 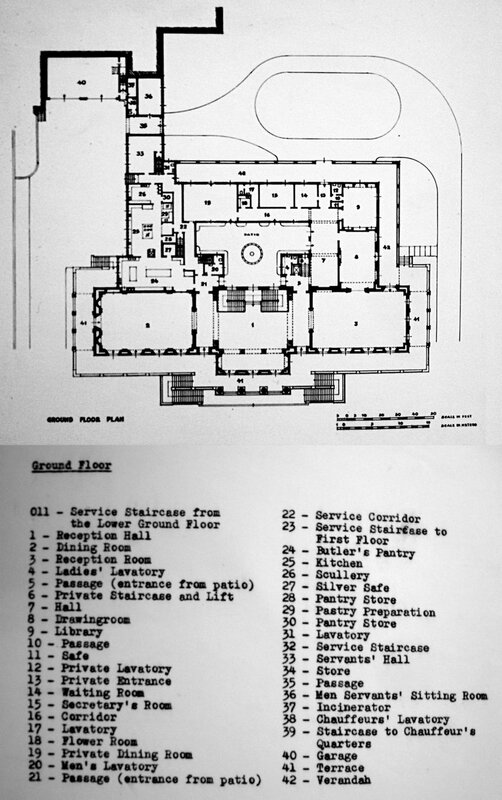 Lower ground floor plan, as built, 1950. 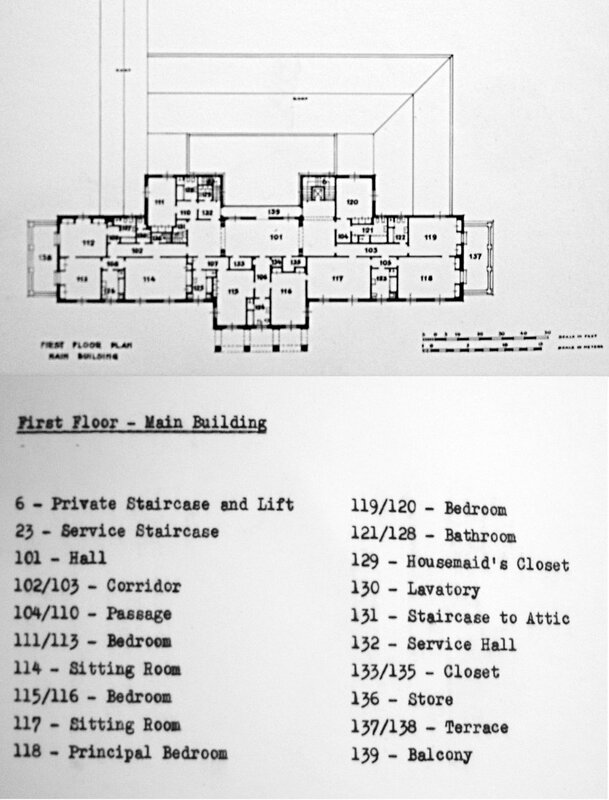 Ground floor plan, as built, 1950. 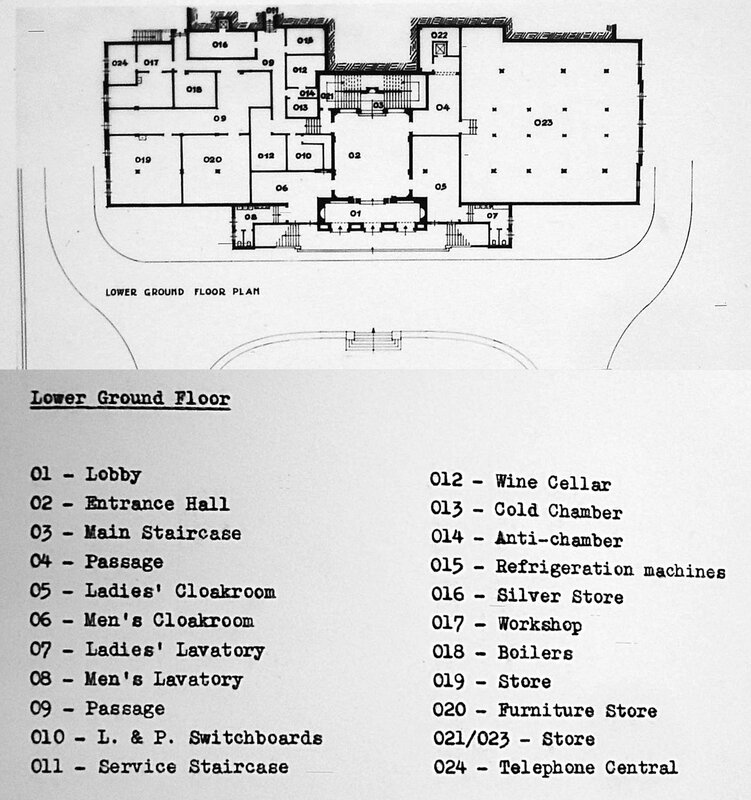 First floor plan of main building, as built, 1950. 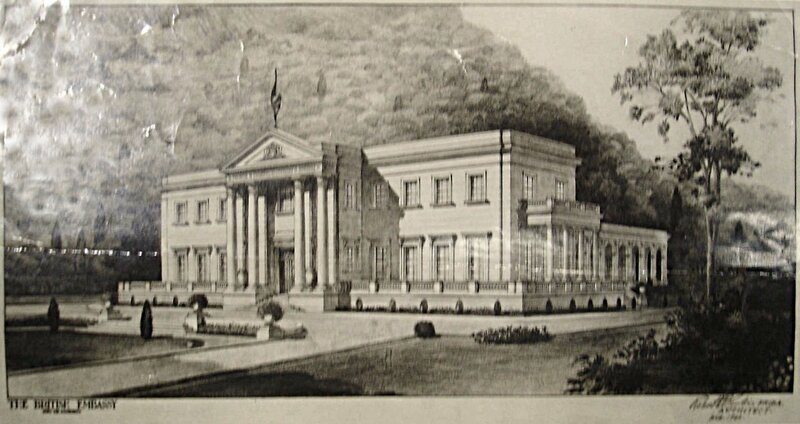 Perspective drawing by Robert Prentice, c.1945 and before elevation changed to 5 bays on either side of portico. 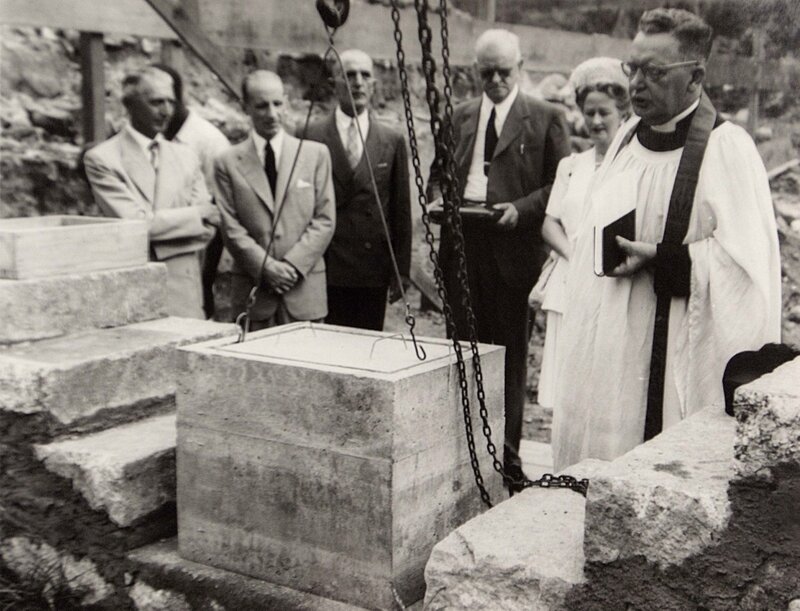 Foundation stone ceremony: Robert Prentice in centre, with Lady Gainer on his left. Various documents and coins were placed in a lead casket within the stone. 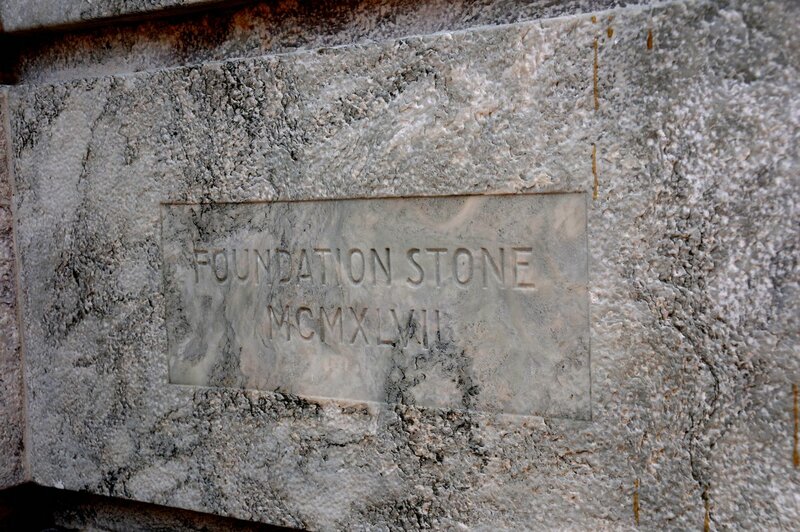 The foundation stone, laid by Lady Gainer on 22 March 1947.